It’s a quiet week before the weekend storm of cobbles starting with Omloop Het Nieuwsblad on Saturday. This micro break gives a moment to look at the team victory rankings and see who’s had a good start to the season. If you think it’s too early to count, think again. There have been 68 days of racing so this year meaning we’re one ninth of the way through the season already. Sam Bennett took an important win for Bora-Argon 18 in Qatar, the Irish sprinter can take on the best. I’m curious to see how he fares this season knowing his contract is up at the end of the year, who will come calling? As an aside the French had a brilliant week in the velodrome but are proving discreet on the road. The rankings above list team wins but as a nation France supplies the most pros to the peloton but can only count on three wins so far: Tony Gallopin and Bryan Coquard in the Etoile de Bessèges… and Japan-based Thomas Lebas in the Tour of the Philippines. As ever, counting wins is merely counting and cycling is so much more than data tables and points. Couting wins doesn’t measure the value of wins whether it’s their status in the sport’s heritage and history nor the economic value such as the publicity generated. Yet all teams long for that first win and those that wait begin to get nervous creating a negative spiral. 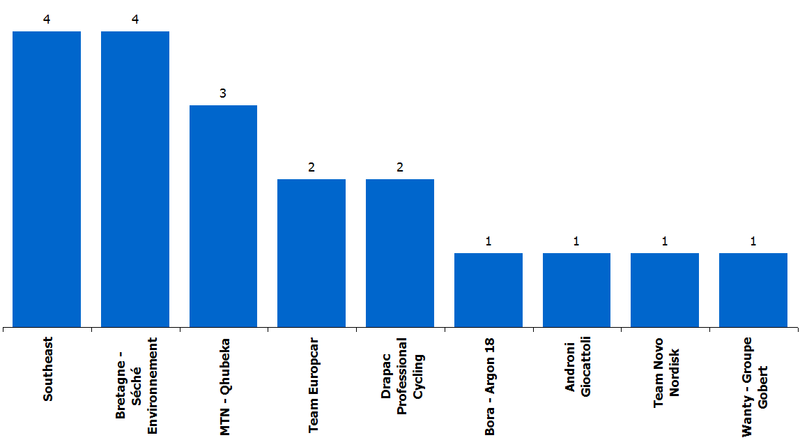 In cycling winning is rare, tiny odds for one rider in a race and relatively low for a team. So as much as winning matters, how you lose is often the story, or put another way, if you can’t always win, how you try is the interesting part. The defunct Cervélo Test Team did a good job of this, explaining the struggles to fans with their “Beyond The Peloton” promo documentaries and it’ll be interesting to see what MTN-Qhubeka does this year given some of the Cervélo team’s DNA appears in the stripey-jersey team. 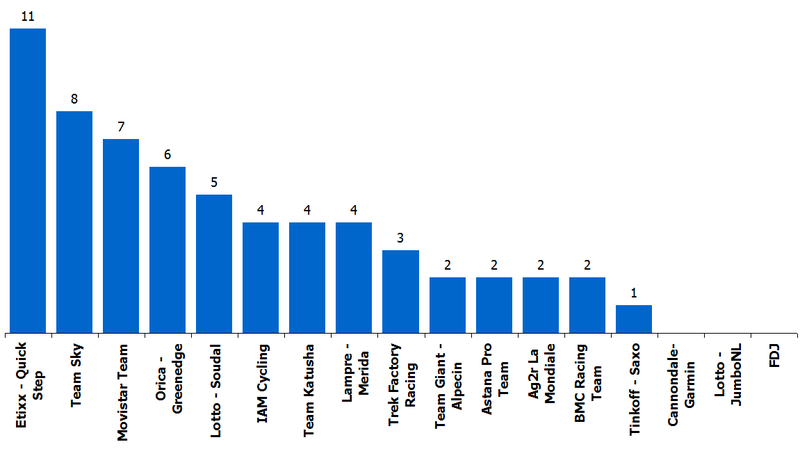 With the classics looming it’s easy to see Etixx-Quickstep pulling away as they win “their” races. No other team has such a focus on the spring classics. Giant-Alpecin should rack up more wins to with Kittel’s return. Surely Peter Sagan’s going to win something soon? Methodology: only World Tour, *.HC and *.1 and *.2 races are counted for the rankings. Overall wins are included, for example two of Lampre-Merida’s tally comes from Oman where Rafael Valls won Stage 4 and he won the race overall. Interesting! I must not read about a lot of races. how are these figures calculated? is it one-day race wins plus stage wins plus GC, or does it include wins in eg mountains classification? the reason i ask is that team sky’s own website only seems to list 7 wins – a stage and overall for froome, a stage and overall for thomas, two stages for porte and one for viviani. Porte also won the Australian TT championships in early January. Otherwise it’s wins only in a race, so stages, one days and overall wins. No counting of secondary classifications like points, mountain, youth, best Argentine/Catalan jersey winner etc. For me the stand out fact from these early season totals is that Sky stand second. Froome, Porte and Thomas have all started well. It will be interesting to see if they can keep it going and bounce back from their disappointing 2014 as a team. And, as we hit the Classics season, one wonders if they can finally make a breakthrough in the type of race their “marginal gains” and “by the numbers” methodology isn’t really suited for. Certainly, in the week before OHN and KBK, two races they’ve had a bit more success in than the others in Belgium, they may have cause for optimism. Tirreno and Catalunya in March will give Froome the chance to add to the win column as well. PS I also note that Oleg Tinkov’s vanity project so far has a single win. I have an intuition that Sagan will find it as hard to win as he did last year in 2015, if not even harder. I agree. Rivals with similar capabilities to Sagan seem to be multiplying. Degenkolb and Kristoff seem more likely for a major classic than Sagan does. No worries, the national and regional championship titles count but the white jersey doesn’t. Meintjies should win something this season, an aggressive and punchy rider. Sam Bennet is an exciting and interesting prospect. Like Sagan he can hang out on the bumpier stages and ride a sprint without a train, he looks to have he guile to get on the right wheels at the right time. A future Mailot-vert in my eyes, Bora will do well to hold on to him. It was good to see several leading road riders taking part in the World track Championships this weekend. Coquard, Viviani, Bobridge, Kirsten Wild, and others. It is often claimed that modern riders can’t mix road and track anymore, but I think they demonstrate you can move between the two. Hopefully more riders will ride both, the madison on Sunday was a great race to watch. Speaking of your point, Etixx-QuickStep has confirmed the signing of newly-crowned Omnium world champion Fernando Gaviria. Nice grab for PL. Will be interesting to see how the youngster is integrated into the team with Cav and Tom. They also brought along a helper for “sockless” Uran. Bora may not have any more wins, if they don’t get their stolen bikes replaced soon! That’s Cult Energy… but another red/black kit combo. Even Bora-Argon 18’s manager Ralph Denk has said it’s hard to see his team in the bunch as so many teams have similar kit. I hope the 2015 is the year the peloton hits “peak black”. The problem is that these fashion designers who many teams seem to be outsourcing their work to are the sort of people who wear black themselves 365 days a year, and who design things to look good on a screen or at a glitzy team presentation, rather than considering what their jersey will look like from a helicopter shot during a twilight criterium or through a fogged up camera lens during a rainy April classic. I mean I always wear black personally, but then I’m not being paid big money to be visible on television. Plus in addition to being similarly coloured, even the designs seem unoriginal, for example in anything other than crisp HD (not always available when watching certain events via certain websites *cough cough*) the new Trek Factory Racing kit looks an awful lot like Orica GreenEdge with its dark body and white shoulders. Despite my other reservations I end up raising a glass to Oleg Tinkov, at least I can identify his riders. I wonder who cares about this unless you’re a team with no wins at events that really matter? A team with a grand tour victory or one of the monuments plays that up much more than some calculated ranking while those who have neither try to make a big deal out of it in the same way a team with no GC hopes plays up the overall team price in a grand tour. It’s barely Valentine’s Day and 1/9 of the season’s racing is done? In the argument over the season being too long and too hard, rather than shorten grand tours and other silly ideas, why not go back to the days of an off-season? Things are getting like NASCAR…I see something about that on the news and think they’ve made their racing season much, much too long. I guess the “absence makes the heart grow fonder” idea is dead. The season may be 1/9th over, but it starts this Saturday! Thanks, I didn’t know. Good to give him more time to learn and it’ll help the team with invites… hope he has a good win bonus. How can Tony Gallopin have one win and Lotto zero? Lotto-Soudal of Belgium vs Lotto-JumboNL of Netherlands, ex Belkin-Rabobank etc. Gallopin rides for the former. You’re absolutely right – I didn’t see this. This will be confusing during the season! The Norwegian presenter on Eurosport has solved that, calling the Dutch team Jumbo and nothing else. What did Novo Nordisk win? I must have missed it. Stage 2 of the Tour de Filipinas. what’s the 3rd win by MTN? Looking forward to some EBH wins now that he’s got more freedom & support. African Continental Championships title for Jacques Janse van Rensburg. Great start for Etixx, with wins in the Desert races, Meersman taking out the Cadel race as well. Really good start to the season for them. I really hope Sky can go well this year in the classics, with G performing well at the moment. Will be interesting to see Wiggo at Roubaix, it must be said when he targets something he wins it, but my gut feel is that he might be out numbered last year and someone like Terpstra will attack again and no one want to take Sagan to the line. I know Astana have not done much, but might we see Lars Boom repeat his Stage win from the Tour at Roubaix? Next post: To Sprint or Not to Sprint?